POST FALLS, Idaho - The Coeur d'Alene Police Department says they have found Chance Belnap safe in Post Falls this morning. 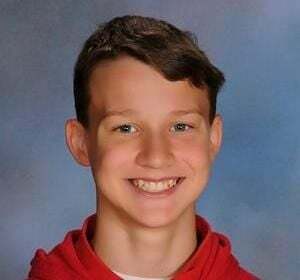 COEUR D'ALENE, Idaho - An AMBER Alert has been issued for 12-year-old Chance Joshua Belnap who was last seen by his mother Friday morning at 7:00am as he left on foot for Woodland Middle School. He has not been seen by his family since. The child may have been seen at approximately 9am in a wooded area near his home. The child has a history of making suicidal statements. The child typically goes from home to school and then back home. Coeur d'Alene Police Department is working with Kootenai County Search & Rescue resources to locate missing 12 yr old Chance Joshua Belnap. The community concern & assistance regarding this incident has been much appreciated. The Police Department is asking that at this time residents, friends, family, and other searchers please restrict their search boundaries to their personal property's in an effort to best utilize the Kootenai County Search & Rescue team. Chance was last seen wearing a red hoody over another shirt, blue jeans, and black and blue shoes. He is 5'10, 120 lbs, with brown hair and blue eyes. His photo is attached to this release. Anyone with information on the whereabouts of Chance Belnap is asked to call Coeur d'Alene Police at 208-769-2320. It is unlike the child that he has not returned home. An AMBER Alert issued states authorities say the child may be in the company of an unknown male and they may be traveling in an unknown vehicle, however the Coeur d'Alene Police Department says at this time there is no evidence to say he was abducted. Police are not working under that assumption. Belnap has a birthmark on his left thigh. He was last seen wearing a red hooded sweatshirt with black markings along the left shoulder and chest, blue jeans and black and blue shoes. He was carrying a black backpack. COEUR D'ALENE, Idaho - Coeur d'Alene Police received a report of a missing twelve year-old boy. Chance Joshua Belnap was last seen by his mother Friday morning at 7:00 am as he left on foot for Woodland Middle School. His mother Kristi Belnap, said she found out Friday afternoon Chance never arrived at school. Kristi Belnap has contacted friends of Chance, and no one has had contact with him. Police have searched the surrounding area but have no leads as to his whereabouts. Chance was last seen wearing a red hoody over another shirt, blue jeans, and black and blue shoes. He is 5'10, 120 lbs, with brown hair and blue eyes. His photo is attached to this release. Anyone with information on the whereabouts of Chance Belnap is asked to call Coeur d'Alene Police at 208-769-2320.